One more Christmas left for cheap booze in Wales? Just like any other festive period in the UK, huge volumes of wines, beers and spirits have been sold by retailers this year. But a major change to the way booze is bought and sold in both Wales and Scotland is coming over the next 18 months or so. Welsh ministers' plan to introduce a minimum price for alcohol in summer 2019, believing it will cut excessive drinking, save lives and reduce hospital admissions. A major policy, due to take effect in Scotland in the next five months, it looks set to sit alongside compulsory carrier bag charges (which Wales led the UK on) and free prescriptions as one of the more visible policy differences with England thanks to devolution. For a while, back in 2012, it looked like minimum alcohol prices were to apply across the Wales-England border. The then prime minister David Cameron proposed a minimum price of 40p per unit (a unit is roughly half a pint of medium strength beer) in an effort to "turn the tide" against binge drinking. The following year those plans were abandoned, although the policy remained "under consideration". UK ministers spoke of fears of hitting responsible drinkers, denied caving in to big business lobbying and insisted banning sales below the cost of alcohol duty and VAT meant a can of lager could no longer be sold for less than around 40p anyway. Welsh ministers' current plans have used 50p per unit as an example of how things might work, but the price is yet to be decided. Updated analysis, expected to be published in February, will be used to make that call. 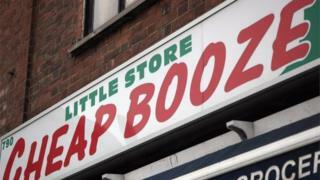 The Institute for Fiscal Studies has estimated a 50p price floor would raise the cost of 70% of alcohol bought in shops. In the run-up to Christmas, AMs on the assembly's Health and Social Care Committee worked their way through some of the statistics and anecdotes on alcohol consumption. For harmful drinkers, whose alcohol consumption causes health problems directly related to drinking, they heard almost half (46%) bought their alcohol for less than 50p per unit, according to Sheffield University research. Tim Ruscoe, of Barnardo's Cymru, shared staff's stories about how alcohol was used in some families as a reward. One 15-year-old boy was rewarded with a bottle of vodka to share with his friends for completing domestic duties such as walking the dog and cleaning his room. Another boy, of the same age, was reported to receive around £400 a month pocket money. Alcohol costs were not a concern for him. Dr John Holmes, a senior research fellow from the Sheffield Alcohol Research Group, highlighted "really good evidence that hasn't been looked at, that doesn't get talked about a lot and that gives us very compelling reasons to be concerned about the effects of cheap alcohol". It was statistics gathered from around 600 drinkers in Edinburgh and Glasgow being treated for alcohol-related health problems. The survey found their average weekly consumption of alcohol was 185 units - 18 bottles of wine or 4.5 litres of vodka. Dr Holmes said: "The average price they paid for that alcohol was 40p per unit and many paid much less. A quarter of them were drinking white ciders—these very strong, cheap ciders—and 11 per cent of them drank those ciders exclusively. "Between December 2010, when the data was first collected, and February 2015, when they followed up the sample, 16 per cent of them had died and the mean age of death was just 51 years old." The UK, much like many parts of the world, has a complicated, some would say confused, relationship with alcohol. Taxes on it are relatively high, compared to elsewhere in Europe. And yet, while some supermarkets are moving away from putting sweets near the checkout to "help people make healthier lifestyle choices", and cigarettes are now out of sight in cabinets, you can see bottles of wine carefully placed around the meat section in some stores. Other countries, Australia for example, insist alcohol is sold from separate liquor stores. There major chains can have a bottle store on their premises, or next door, but a booze aisle in the main store not allowed. On the other hand, you can also experience a drive-through off licence. Back home, the assembly health committee also heard warnings about the border. How many drinkers in Wales might be tempted to make regular trips to England, to stack up on alcohol, a bit like the "booze cruises" to Calais? Might we need a few enforcement officers in the soon to be abandoned Severn bridge toll booths? Perhaps not, but one thing is probably a safe bet. This is a Welsh Government policy we are likely to be talking about for some time to come.